Skills Certification Evaluators are NATE Trainers who have proven an understanding of the Skills required. To find an Evaluator willing to view your submission via video email skills@nationaltreibball for a referral. Evaluators and test candidates will agree between themselves as to the best way to share video. NATE suggests use of a private or unlisted YouTube channel, or an online application such as Dropbox. Evaluators have the option to charge fees, or not, as they see fit, to compensate for their time and expertise. 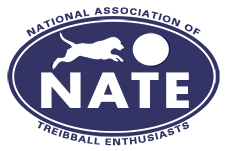 NATE receives no fee until a test has been passed and the handler candidate applies for a Certificate. It is the responsibility of both the test candidate and the Evaluator to maintain the integrity of testing by ensuring, to the best of their ability, that the test parameters adhere to the Skill Exercise requirements. Dogs must be run by the handler with whom they are registered. NO substitute/stand in handlers. For a video of an attempt at Skill Certification, the handler and dog must be in the video frame at all times. There is no editing allowed once an individual run is started. Each video should show a single test. The title page or name of the video should show text of Handler and Dog information (handler’s first and last name, and the name of the dog as it is to appear on the desired Certificate), Skill Category and Skill Level. An overview of the testing space lay-out with relevant distance markings must be shown prior to the beginning of the test. The overall size of the testing space, whether indoors or out, is not important. However, the video must clearly show the distances relevant to the test being attempted. For example, in the Level 1 Distance exercise, the target object is to be placed 10 feet from the handler’s area line. Cones, signs, flags, ring gates, or lines drawn or marked with tape or chalk maybe used to indicate these distances. The distances required for each test are available here. The video must show the entire area for the test being submitted, and may also pan the space for closer views of the testing space. Overview of the space set-up must be clearly described, either by narration or text, separate from the test being shown. Handler and dog must be seen in the video at all times during the test. The video and lighting must be of sufficient quality to clearly see handler, dog, field markings and the entire test without obstruction. For tests recorded outdoors, the video should be taken with the sun NOT IN FRONT OF THE VIDEOGRAPHER. The camera should be stationary and set up for the best angle for the Evaluator’s view – for example, to the right or left of the handler, and about half way along the length of the testing space, if the distance is short, or slightly closer to one end of the space and angled to show both dog and handler. The dog may be on or off leash prior to the beginning of the test, but should be under the handler’s control. The original soundtrack of the video recording must be submitted. The soundtrack may not be dubbed or replaced with music or narration. If the Evaluator determines that the video requirements are not met in part or whole, the test candidate may re-submit a video.